Easter Birdies Need Homes Too! With the arrival of Easter, so begins the nesting season for many wild birds. Scientific data has shown a vast decrease in available nesting sites, mostly due to the increased destruction of natural habitat. Competition from non-native species also contributes to the decline in possible nest sites. This year, instead of adopting cute baby chicks at Easter Time, consider a unique birdhouse. They are available in sooooo many themes! You may want to hide one for the Easter Egg Hunt for one lucky recipient to take home. 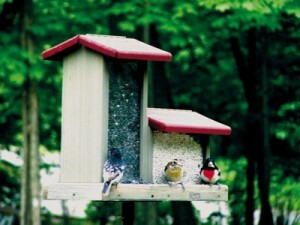 With a serious shortage in nesting sites, a real home will make a difference for wild birds in your yard! If you’re tired of filling your bird feeders a little too often, it might be time to check out a large capacity hopper bird feeder. 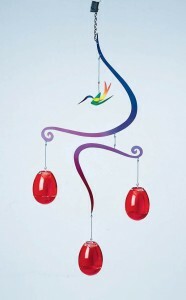 These bird feeders are available in a multitude of designs, materials and colors! They tend to hold more seed than other styles and accommodate more species of wild birds for your viewing pleasure. 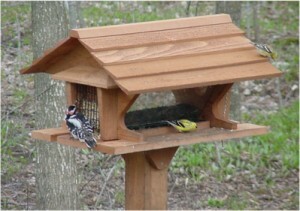 The feeder pictured above is a double hopper-with a huge seven-quart capacity. It is also available in recycled materials that are guaranteed to never crack, split or fade, and will last a lifetime. A good investment for your feathered friends! Use Flowers as Wild Bird Feeders Too! Another way to greatly help out wild birds is through habitat. Aside from hanging wild bird feeders that offer seed and suet, try planting trees and flowers which provide sustenance for wild birds in your yard. There are many native plants, hardy in temperament, which can add value and lasting beauty to your home. Cone flower is a popular choice for many wild bird species, and being a perennial is an extra added bonus. Sunflowers are adored by many wild birds, and the faces can be used for decorative purposes after the flower dies. 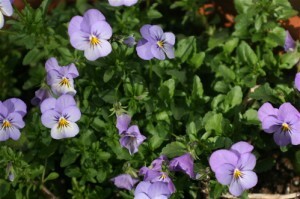 Some may be annuals or perennials depending on climate. Water is an excellent attractor for any type of bird. No matter the species, or their individual food preferences, water is is must, a necessity for life. 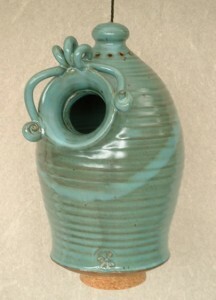 Water can be provided in many ways for birds and other wildlife. By creating a small pool or pond in your yard, you can offer this life-sustaining element for very little cost–and the impact is big! A bird bath placed in a sheltered area is an optimal spot for songbirds, providing a dependable water source. Birds not only drink water, but must bathe to keep feathers clean and free of parasites, which keeps them in proper working condition. Birdbaths are available in a multitude of styles and colors, ranging from hanging to pedestal, and deck-mounted models for a close up viwing experience. Be it glass, ceramics, copper, resin or a stone, a bird bath provides life-sustaining water, and will attract the most species of wild birds. 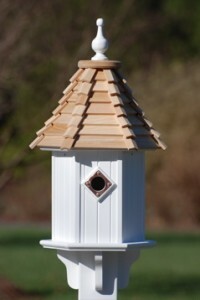 Birdhouses seem to come in every size, shape, and theme known to man. At a lovely garden wedding last spring, the reception was held outdoors and the theme was rustic-but so very elegant. Not too sure exactly how they pulled this off, managing to incorporate all the decor that was just beautiful. A decorative birdhouse adorned each table as the centerpiece. They were rutic looking, but real houses meant for the outdoors. One person from each table got to take one home. What a great idea I thought, instead of throwing away the centerpiece, these could actually be used to house the birds! Why a Predator Proof Blue Bird Birdhouse? 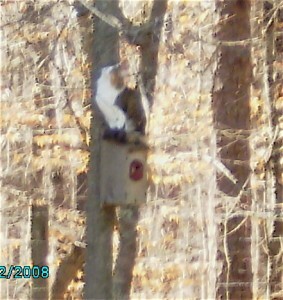 Here’s the best excuse I can find for using a predator proof blue birdhouse. My neighbor’s cat drives me crazy–seeing her under my feeders makes my blood boil! Here she is on top of my birdhouse!! Don’t get me wrong, I love cats , and have five of my own. Fours stay in, and the ex-feral goes out for 5 minutes in the morning before work and 5 minutes when I get home from work. A predator proof blue birdhouse thwarts this kind of nasty behavior as it’s design just doesn’t allow for this kind of dangerous situation. Seeing birds and wildlife in your backyard adds a special quality that is priceless. We witness the urban sprawl of development daily, not actually realizing how many birds and animals are displaced from their natural environments. It is increasingly important for land owners to provide mini-sanctuaries for birds and other wildlife to help offset this unbalance. Aside from hanging wild bird feeders, you can add to the beauty and value of your home by planting trees. Certain trees provide high food value for birds and other wildlife, thus increasing your viewing pleasure. Summer fruit trees include; Cherries, Dogwoods, Plums, and Apricots. Trees producing seeds include; Ashes, Birches, Firs, Hemlocks, Maples, Spruces, and Sweetgum. Trees that produce nuts and acorns are; Butternut, Black Walnut, Chestnuts, Hazels, Hickories, Oaks and Pecans. There are also trees which provide fall and winter fruit such as; Apples, Crabapples, Dogwoods, Hackberry, Hawthornes, and Mountainash. So, beside just plain old wild bird feeders, try planting trees you know will benefit both birds and wildlife in your yard. People like to hang things in their yards….we see it all the time. Wind chimes, wind socks, flags, and the usual suspects, birdhouses and feeders. With hummingbird season approaching (starting now in the southeast region) it’s time to hang them as well. This very cool hummingbird feeder is whimsical garden art, that is totally functional too. The pods look small but hold 10 ounces of nectar each. They have a special UV coating that resists fading or scratches, to keep them looking new. A neat sculptural mobile to feed your hungry hummers. What will they think of next? Talk About A Nice House! They sure are making some pretty nice birdhouses these days! You’d think this architectural birdhouse is wood…but it’s not. It is made from PVC. Yes-vinyl, just like they use to build real houses. Vinyl siding, with no worries of painting or fading or rotting. Same thing here! A unique birdhouse made to last a lifetime. Imagine how a bird must feel living in a castle like this? No drafts, no leaky roofs, and no damp walls when it rains! These birdhouses are of the highest quality, and although they may cost a few dollars more than wooden bird houses, these are virtually maintenace-free. Consider it an investment in the housing market! You can attract more birds to your yard with the use of bird baths. Water is like a visual magnet to birds…they love it, to play, to bathe, to preen and to drink. Available in a myriad of styles and colors, the options are almost endless. 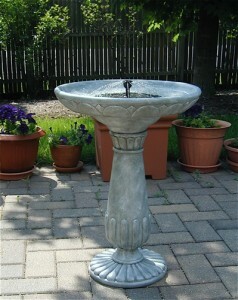 Pedestal birdbaths are always a good choice, and tend to act as a focal point in a garden. 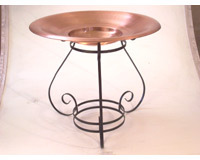 Hanging bird baths add a warm touch to almost any space. Keep in mind that you will need to clean this bird bath often, so choose one that is easy to clean. Also, birds prefer shallow pools, so a bath that is too deep will need a large rock, or something for birds to “walk in” or perch on. Another thing to consider is year-round use. If you live in areas with harsh winter temperatures, it’s probably best to choose a bird bath that will accommodate a heater in winter. Water is so critical to birds when temperatures drop below freezing–so if you’re considering a birdbath, why not get one that allows for year-round enjoyment? For you and the birds!